Health ministers and experts from countries in the WHO Southeast Asia region on Monday began the five-day deliberations on priority issues, emphasising on universal health coverage for ensuring health for all.“Universal health coverage is at the core of Sustainable Development Goal 3 and can be a very powerful tool for social, gender and economic equity,” said India’s Minister of Health and Family WelfareJ. P. Nadda, inaugurating the 71stsession of the WHO Regional Committee for Southeast Asia. “The year 2018 is also the 40th anniversary of the historic Alma-Ata Declaration, and due to our collective efforts, the regionis better prepared and is progressingtowards the shared global vision of health for all through universal health coverage,” he said. Nadda said India has fast-tracked many initiatives aimed at achieving all the core tenets of universal health coverage – strengthening health systems, improving access to free medicines and diagnostics, and reducing catastrophic healthcare spending. The WHO Southeast Asia region’s priority programs are already aligned with these goals, and the region is witnessing growing support for health from the highest levels of government, and impressive progress and achievements. National Institute of Transforming IndiaCEO Amitabh Kant and Ministry of Health and Family Planning Health Secretary Preeti Sudan spoke at the inauguration and shared the various initiatives being taken by India to improve the health and well-being of people. Marking 70 years of WHO in the Southeast Asia region, a special commemorative document was released by Nadda, Dr. Khetrapal Singh, Jane, and other ministers/heads of delegation from the WHO Southeast Asia region, among other dignitaries. WHO Director-General Dr.Tedros Adhanom Ghebreyesus will be joining the Regional Committee session later in the week. Representatives of a number of partner organisations and civil society are participating in the meeting that is expected to adopt resolutions on key health issues. The Regional Committee session, the highest policymaking body of WHO in the region, is hosted annually by any one of the 11 member countries in the region, or the WHO Southeast Asia Regional Office. The session this year is being hosted by the Regional Office. Member countries of WHO South-East Asia Region on Tuesday committed to make essential medicines, vaccines, diagnostics and medical devices affordable and accessible to all, both within the Region and beyond. 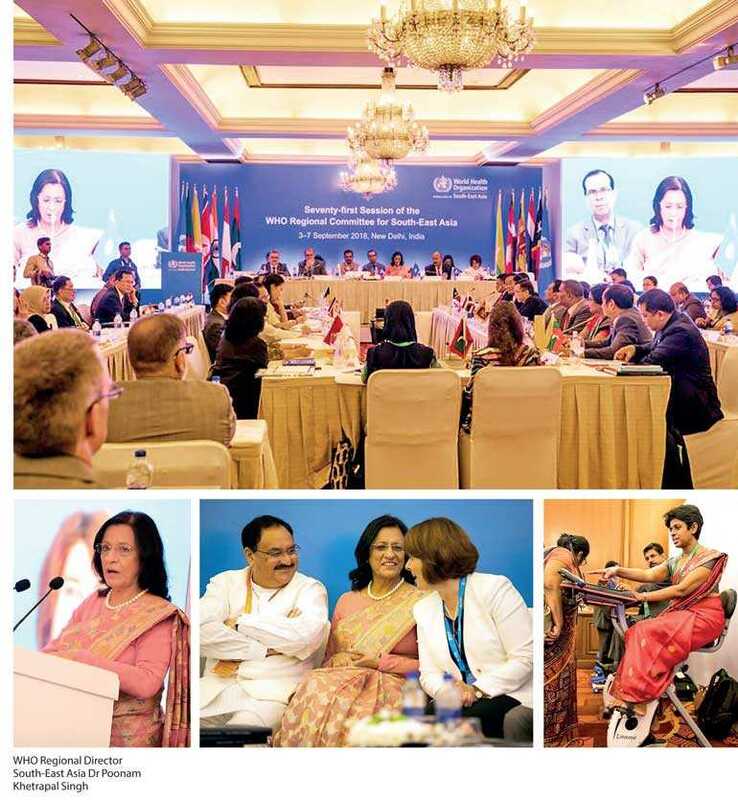 “Access to safe, effective and affordable medical products vital to prevent sufferings and impoverishment resulting from high out-of-pocket expenses on healthcare by families, especially the poor,” Dr Poonam Khetrapal Singh, Regional Director, WHO South-East Asia Region, said, as health ministers and officials of the 11 Member countries signed the ‘Delhi Declaration’ to improve access to essential medical products. Medical products are a major component of out-of-pocket health care spending which has pushed 65 million people into poverty in the WHO South-East Asia Region. Though significant efforts have been made by countries in recent years, as improving access to essential medicines is a WHO flagship priority programme in the Region since 2014, challenges remain in providing the right medical products at the right time to those in need. To overcome challenges, the Delhi Declaration calls for allocation of sufficient financial resources by countries, as part of overall health financing strategies, to reduce out-of-pocket payments of families on essential medicines. The declaration calls for strengthening national policies, regulation, supply chain management, and capacity to leverage intellectual property and trade for public health, to improve access to medicines and vaccines. Signing the declaration at the Seventy-first Regional Committee Session of WHO South-East Asia Region, Member countries committed to developing an effective, transparent and participatory mechanism for regional price negotiation and pooled procurement to ensure accessibility and affordability of essential medical products for life threatening and rare diseases. The Member countries committed to strengthen regulatory cooperation and collaboration to improve availability, quality and safety of essential medical products through the South-East Asia Regulatory Network (SEARN). With the Region emerging as a major manufacturer of essential medical products especially generic medicines, Member countries agreed to leverage this strength to improve accessibility and affordability both within the Region and beyond. The Member countries committed to developing an essential medical products list, in particular essential diagnostics list, for improved patient care, affordability of quality tests, and greater capacity to diagnose diseases during outbreaks and strengthened capabilities of national laboratories. The declaration also emphasized on more appropriate use of antibiotics; and innovation and investment in R&D including for neglected diseases, and affordable medical products. The Member countries agreed to ensure universal accessibility and affordability of essential medical products by 2030, as part of achieving universal health coverage (UHC) and the health related goals of SDG 2030 agenda. The Regional Committee is held annually and is hosted by one of the 11 Member countries or the WHO South-East Asia Regional Office.